Antibiotic is an antimicrobial substance, which combats bacterial infections and occasionally protozoan infections. In addition, they are used to cure several diseases such as strep throat, urinary tract infections, sinus infections, pneumonia, skin infections, ear infections, and others. There are numerous ways of classifying antibiotics, however, the most common classification is based on their chemical structures, spectrum of activity, and mode of action. Currently, the demand for beta lactam and beta lactamase inhibitors class of antibiotics is high among healthcare providers. The global antibiotics market generated $42,335 million in 2017, and is projected to reach $50,374 million by 2025, growing at a CAGR of 2.1% from 2018 to 2025. The growth of the global antibiotics market is increasing due to increased consumption of antibiotics in low & middle-income countries, major investments in R&D activities by pharmaceutical companies, and rise in prevalence of infectious diseases. However, development of antibiotic resistance and increase in drug approval costs are projected to impede the market growth. On the contrary, discovery of advanced prospect molecules and introduction of novel combination therapies to treat antibiotic-resistant microbial infections are expected to offer remunerative opportunities for market players. Based on class, the market is classified into beta lactam & beta lactamase inhibitors, quinolones, macrolides, and others. Beta lactam & beta lactamase inhibitors segment is further divided into penicillin, cephalosporin, carbapenem, and monobactam. The beta lactam & beta lactamase inhibitors segment generated the highest revenue in 2017 and is anticipated to maintain its dominance throughout the forecast period. This is attributed to its broad-spectrum activity, which heals infections caused due to multiple groups of bacteria. Thus, the demand for beta lactam & beta lactamase inhibitors is high among the healthcare providers and patients, which in turn fuels the growth of the global antibiotics market. Based on the spectrum of activity, the market is bifurcated into broad-spectrum antibiotic and narrow-spectrum antibiotic. The broad-spectrum antibiotic segment is projected to exhibit the highest growth during the forecast period. This is attributed to the fact that broad-spectrum antibiotics act against a wide range of diseases, which in turn helps to combat antimicrobial resistance. Region wise, the antibiotics market is analyzed across North America, Europe, Asia-Pacific, and LAMEA. Asia-Pacific dominated the market in 2017, accounting for the highest share, and is anticipated to maintain this trend throughout the forecast period. This is attributed to increased consumption of antibiotics, their easy availability, and rise in sale of over-the-counter drugs. The report provides a comprehensive analysis of the key players operating in the global antibiotics market, namely, Abbott Laboratories, Allergan Plc., F.Hoffmann-La Roche Ltd., GlaxoSmithKline Plc, Merck & Co. Inc., Mylan N.V., Novartis International AG (Sandoz), Pfizer Inc., Sanofi, and Teva Pharmaceutical Industries Ltd. The other players in the value chain include Aurobindo Pharma, Bayer HealthCare, Eli Lilly, Lupin Pharmaceuticals, Sun Pharmaceutical, Shionogi, and others. A comprehensive analysis of the factors that drive and restrain the growth of the global antibiotics market is provided. 3.6.1.3. Development of novel approaches for new antibiotics for treating bacterial infections and a large number of clinical trials. 3.6.3.1. Discovery of advanced prospect molecules and novel combination therapies to treat antibiotic-resistant microbial infections. 9.5. Merck & Co. Inc. Antibiotic is a chemical compound of natural or semi-synthetic or synthetic origin, which inhibits the growth of bacteria and protozoans. Antibiotic is either produced by a microorganism (natural) or from a similar product produced wholly (synthetic) or partially (semisynthetic) by chemical synthesis. 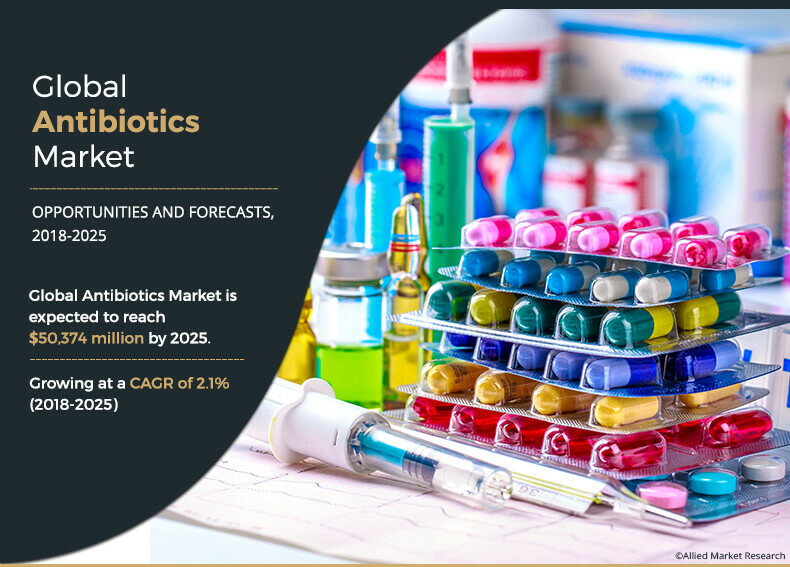 The global antibiotics market is expected to exhibit significant growth during the forecast period, due to increased consumption in low- & middle-income countries and rise in prevalence of infectious diseases. In addition, development of novel approaches for new antibiotics to treat bacterial infections and increase in clinical trials supplement the market growth. However, low investment in R&D for the development of new antibiotics, time taken for regulatory approval, and increase in drug approval costs are expected to hinder the growth of the market. The semisynthetic segment presently dominates the market attributable to the fact that the semisynthetic antibiotics possess improved coverage and effectiveness against a wide range of organisms. In addition, they can be administered either intravenously or orally or topically, and are lower cost to administer than other antibiotics, in some cases. However, the synthetic segment will grow with a highest rate during the forecast period, due to rise in need for synthetic membrane-targeted antibiotics due to antimicrobial resistance. Moreover, synthetic antibiotics have various advantages over existing antibiotics such as a broad spectrum of activity, no cross-resistance with the existing antibiotics, rapid bactericidal activity, and low probability to develop resistance. Asia-Pacific was the leading revenue contributor to the global antibiotics market in 2017, and is expected to remain dominant throughout the forecast period, due to increase in consumption of antibiotics, easy availability of antibiotics, and rise in sale of over-the-counter drugs. However, LAMEA is expected to grow at the highest CAGR during the study period attributable to easy obtainability of antibiotics over the counter and no obligation on their usage in this region. 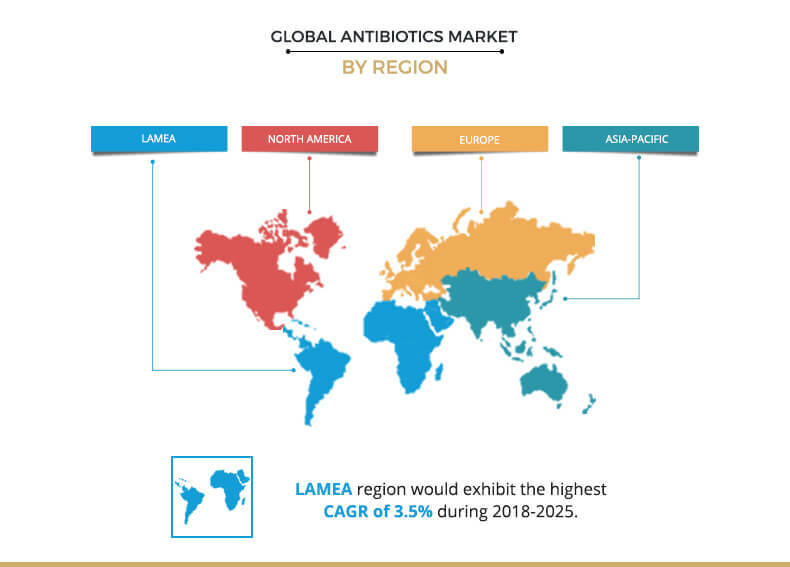 In addition, Asia-Pacific and LAMEA are expected to offer lucrative opportunities to the key players during the forecast period, due to high prevalence of infectious diseases and rise in demand for antibiotics.